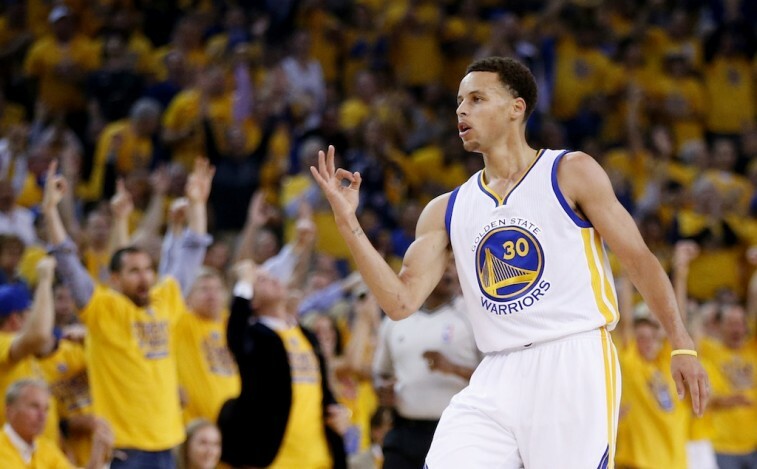 The 2014-15 NBA season has been the Stephen Curry show. With a flurry of threes, an unmatched handle, and and a fondness for the theatrics, the Golden State Warrior has become more than just a superstar. He’s become more than simply household name. He’s turned into the face of the NBA’s next generation. Every time he steps on the floor should be reason enough to pay attention. He is one of those rare athletes who, on any given night, is capable of doing something spectacular. And with a year that saw him average 23.8 points, 4.3 rebounds, and 7.7 assists, the league decided it was time to reward him for his spectacular play, with the 2014-15 Most Valuable Player award – the first of his career. Of course, for a guy with his competitive nature, individual accolades are not enough. Sure he set a new NBA record for three-pointers in a single season, with 286. Sure he shot 48.7% from the field, connected on 44.3% of his threes, and was 91.4% from the charity stripe. These are all sensational accomplishments. But what really matters in an NBA championship. And at this point in his six-year career, that prize has eluded him. That could all change if he is able to lead the Warriors past LeBron James and the Cleveland Cavaliers in the upcoming 2015 NBA Finals. It’s been 40 years since the Golden State Warriors have played for a championship – the longest drought in NBA history. And if Curry can get over this last hurdle he, too, can make some history. Only five players in the history of the National Basketball Association have ever won a title the same year they managed to win their first MVP award. This is Curry’s chance to make it No. 6. Good thing the stakes aren’t already high enough. While the Warriors sharpshooter is still four wins away from adding his name to the list, let’s take a look at the five players who’ve earned a place in this exclusive group. In his illustrious 13-year career with the Boston Celtics, Bob Cousy would go on to win six NBA championships. However, despite all his talent and wizardry with the basketball, Cousy managed to only win one MVP award. Fortunately for him, the 1956-57 season wasn’t just filled with individual success, but also included team glory. During the regular season, Cousy’s averaged an impressive 20.6 points, 4.8 rebounds, and 7.5 assists a game. However, when the postseason rolled around, the Houdini of the Hardwood took his play up a notch. Playing an average of 44 minutes per game, Cousy put up 20.2 points, 6.1 rebounds, and 9.3 rebounds per contest. With the Cooz leading the way, the Celtics would go on to play the St. Louis Hawks in the 1957 NBA Finals, and end up winning the series in seven games. 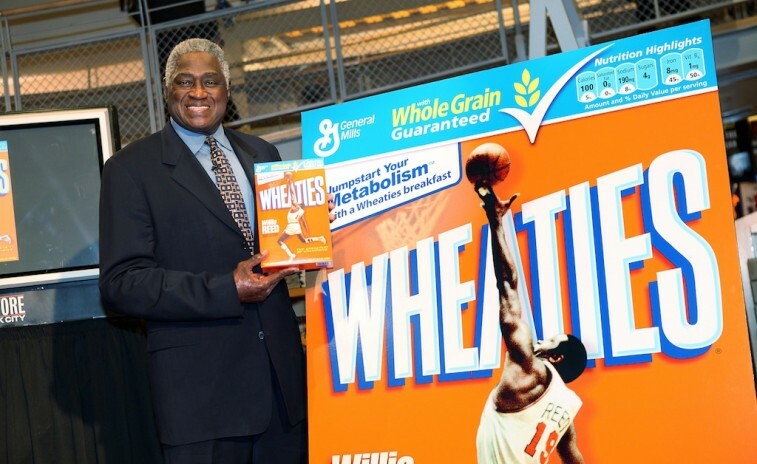 New York Knicks legend Willis Reed would win his first and only NBA MVP award during the 1969-70 season. During that season, Reed averaged a double-double on the year, with 21.7 points and 13.9 rebounds per contest. He played over 38 minutes a game, shot 50.7% from the field, and connected on 75.6% of his free throws. This level of play carried over into the postseason and helped the Knicks make a run at the title. During the 1970 NBA Playoffs, Reed would average 23.7 points, 13.8 rebounds, and 2.8 assists per game. The Knicks would take out the Baltimore Bullets in the Eastern Division semifinals, topple the Milwaukee Bucks in the Eastern Division finals, and set the stage for a thrilling seven-game NBA Finals series with the Los Angeles Lakers. It was in this final game that Reed proved what kind of warrior he truly was. Even with a torn leg muscle, Reed’s gutsy play would inspire the rest of his teammates: The Knicks would take Game 7 by a score of 113-99, and Reed would be named the NBA Finals Most Valuable Player. It wouldn’t be wrong to associate Kareem Abdul-Jabbar with the Los Angeles Lakers; the player and franchise ended up doing wonderful things together. However, it was the Milwaukee Bucks who drafted the future Hall of Famer with the first overall pick in the 1969 NBA Draft. And it was with this organization – during the 1970-71 season – that Jabbar would capture his first MVP award and win his first NBA title. During the regular season, the Bucks center averaged a remarkable 31.7 points and 16 rebounds a game. 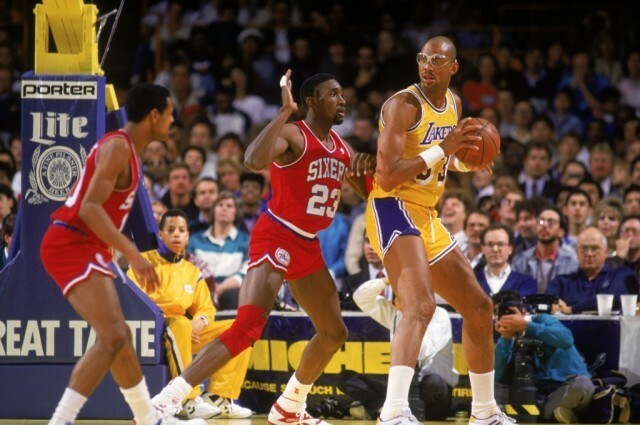 In the playoffs, Jabbar’s scoring would dip to 26.6 points per contest. However, his rebounding average would rise to 17 a game. Riding the wave of 66-16 regular-season record, the Bucks would steamroll the competition in the 1971 postseason. This group would only lose two games in the entire playoffs. The NBA Finals proved even less difficult. Behind Jabbar’s 27.0 points, 18.5 rebounds, 2.8 assists per game, Milwaukee would defeat the Baltimore Bullets in four games. Watching Hakeem Olajuwon post up a defender was a thing of beauty. At 7-foot, 255 pounds, he had incredible foot work, a smooth turnaround, and the sweetest shake you’ve ever seen. It was like a dream. It was like a Dream Shake. And in the 1993-94 season, both Olajuwon and the Houston Rockets would be rewarded for their efforts. The Hall of Famer earned the MVP award for a season in which he averaged 27.3 points, 11.9 rebounds, 3.6 assists, and 3.7 blocks per contest. He played 41 minutes a game, shot 52.8% from the field, and knocked down 71.6% from the charity stripe. Following a regular season that saw it win 58 games, Houston entered the postseason as the No. 2 seed in the Western Conference. In the 1994 NBA Playoffs, the Rockets would defeat the Portland Trail Blazers in the first round, the Phoenix Sun in the Western Conference semis, and the Utah Jazz in the conference finals. 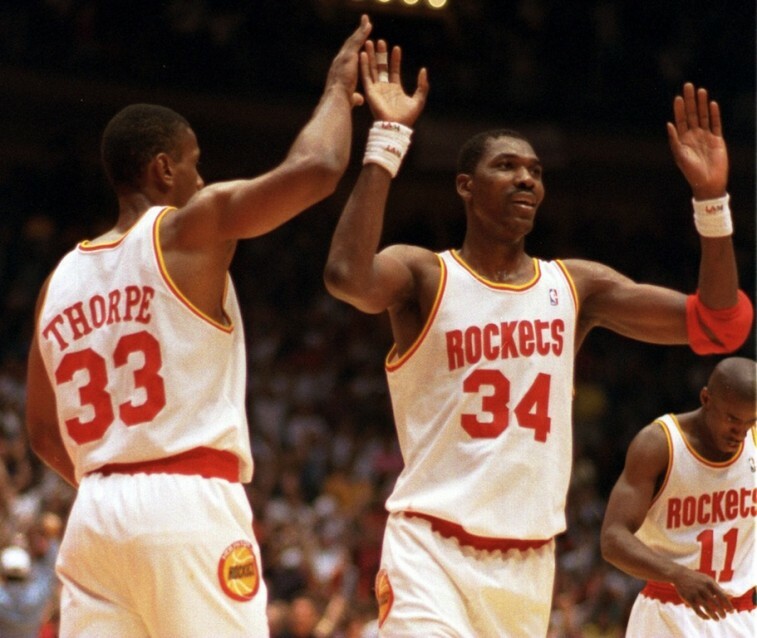 In a battle of elite big men, Olajuwon and the Rockets met Patrick Ewing and the New York Knicks in the NBA Finals. After seven hard-fought games, Houston would come away victorious and Hakeem The Dream would take home Finals MVP honors. 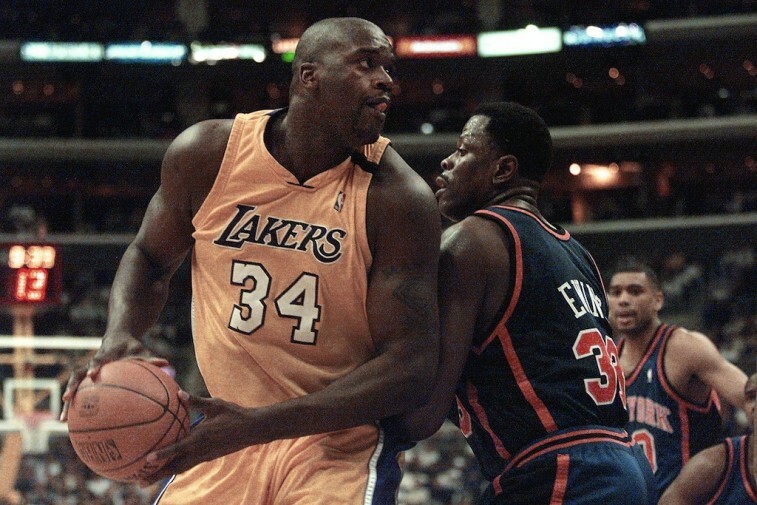 Shaquille O’Neal will go down as one of the most dominant big men in the history of the National Basketball Association. But out of all his years of beating up opponents, his 1999-2000 season with the Los Angles Lakers still manages to stand out among the rest. At 29.7 points per game, the Diesel led the NBA in scoring. He also led the league in field goals (956), field goal percentage (.574), player efficiency rating (30.6), win shares (18.6), and value over replacement player (9.3). O’Neal would continue to dish out the same sort of punishment in the postseason. Shaq’s numbers in the 2000 NBA Playoffs were pure insanity. He averaged 30.7 points, 15.4 rebounds, 3.1 assists, and 2.4 blocks per game. O’Neal shot 56.6% from the field and could not be stopped. While the Lakers, as a whole, were challenged throughout this postseason run, they would defeat the Kings, Suns, Trail Blazers, and Pacers, on the road to a first of three straight NBA championships.